Trying to write your own resume? In a radical departure from every “how to” book on resumes, a former recruiter suggests a better way – hiring out the job. Why? Because a good professional resume writer can craft a better resume, write it faster, and in the end, save you money. — How to avoid the resume mills. — How to analyze writers’ websites for clues to their worth. — The 5 critical things to demand before any writer gets your business. 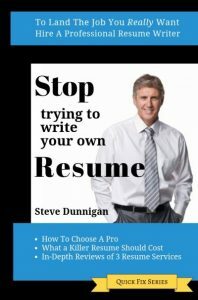 — What a killer resume should cost – so you don’t waste your money. Bonus: in-depth reviews of 3 of the best resume writing companies out there. The author, a former recruiter and professional resume writer, puts his insider knowledge to work, analyzing 3 companies providing online resume writing services. You’ll see why he likes them, what they charge, and how to proceed. Give yourself a competitive advantage. Find out how easy it is to hire a professional resume writer, how beneficial it can be, and how it can actually save you money in the end.